The final chapter has been written on the highly-anticipated and much maligned movie on the life of country music icon Hank Williams, at least until the DVD is released. I Saw The Light—starring Tom Hiddleston as Hank, written and directed by Marc Abraham, and based off of the Hank biography written by Colin Escott—is a commercial flop. This is on top of receiving terrible reviews, being pushed back from November 2015 to April 1st for the national release, and being criticized for its novice director and the selection of Hiddleston as the leading man. I Saw The Light made only $45,000 the first week after the limited opening on March 25th, but it was only shown in a total of 5 theaters in New York, Los Angeles, and Nashville. The next week the film entered a total of 741 theaters nationwide, but could only squeeze out a combined total of $745,000 in revenue, or just over $1,000 per screen. Reports from theaters were of mostly empty seats. Hopes that high-profile interviews and press with star Tom Hiddleston would help bolster the film didn’t do much more for the second full week of the movie. Dropping down to 548 total theaters showing the movie, revenue dropped 55% to $307,000. These are the disappointing stats from the movie site The Numbers. The massive second week decline and $1.4 million gross total so far pretty much ensures I Saw The Light will be a financial bust. The budget for the film was $13 million. Director Marc Abraham’s Rat Pack Entertainment also produced and financed the film. Many critics skewered the film for a terrible screenplay, while sparing the actors—including Hiddleston—for doing the best they could under the circumstances. In Saving Country Music’s review, the movie was given credit for being slightly better than expected given the bad reviews, and for having some good individual scenes, but it’s still hard to say that I Saw The Light in any way held up to the standards of other country music biopics such as Coal Miner’s Daughter or Walk The Line set, or to the compelling real story of Hank’s brief and troubled life. 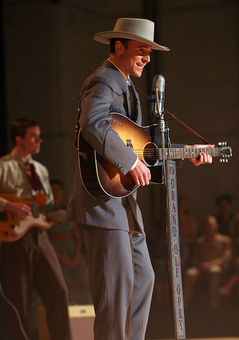 All Hank fans can hope for now is that in the future another Hank Williams movie will be made that can be the definitive work on the country legend’s life, if the financial flop of I Saw The Light doesn’t make the prospects for another movie that much more difficult. Kinda on topic but have you heard of the novel Hank and Muddy by Stephen Mertz? It’s a mystery/action kinda book that ha Hank Williams and Muddy Waters partnering together to solve a mystery. It’s a really fun read and it’s in first person so you definitely get into Hank’s and Muddy’s minds. I’m now curious to see a book review of that and what you think of the portrayal of Hank in that novel. I saw the movie and it was great for what it was! It’s like the RDJ movie In Dreams from years ago, I can see why there was bad reviews and everything but I still enjoyed it for what it was. It’s really hard for me to find the time to get into the fiction side of country music writing. It’s hard enough to keep up with all the biographies, but I will check it out. Thanks for the suggestion. I never realized how much I’ve wanted to see a book/movie/game/etc with that premise. Thanks for bringing it to my attention! hey. it’s Fuzzy. I haven’t been on SCM much in forever, had a lot on my plate. been busy with life (some good, some bad) and had a rough Christmas and January, February was better. Anyway the other day I don’t remember what I was thinking about but you popped into my mind for some reason. since I’m not on here much try e-mailing me RedwallSteev@musician.org (just lemme know who you are so I don’t delete it) and I’d love to hear your thoughts about things I’m thiniking about. I saw this movie last week. There were about three people in the theater, including myself. While prospects for another film about Hank Williams are dim for the near future, at least this one is obscure enough that it won’t kill the idea outright. 741 theaters might technically be a wide release, but it’s entirely below average compared with other films in, say, 2,000 theaters (Star Wars: The Force Awakens opened in 4,134 theaters). I’m not going to discount that I Saw the Light was anticipated in certain circles, but I’m a movie guy and if I didn’t read this site I wouldn’t even know it exists. That’s saying something. I don’t see every movie that comes out but there’s rarely any that I’m unaware of in wide release. I’ve seen zero chatter for this film outside of SCM and similar sites, even before the negative reviews and release date push. Hopefully that relative obscurity benefits us with another take on the story at some point. This certainly isn’t the first film about Hank Williams so I doubt it will be the last. The only reason this film is obscure is because the reviews were so bad, theaters didn’t want to pick it up, and nobody wanted to see it. But I wouldn’t count that as “obscure” in the sense that it’s an indie film nobody knew about. It has a big budget, was made by a major Hollywood production company, was distributed by a major distribution company in Sony Classics, and Tom Hiddleston made the rounds of the talk shows, so it was far from obscure for people in the industry. In fact the film world is probably playing rapt attention to how the movie flopped and is likely to lose over $10 million. That may not affect a better film getting made in the future, but it certainly won’t help. They need to do a Keith Whitley movie. It would be so good and tragic. Also, a movie on the Gin Blossoms, particularly about Doug Hopkins life, would be great. 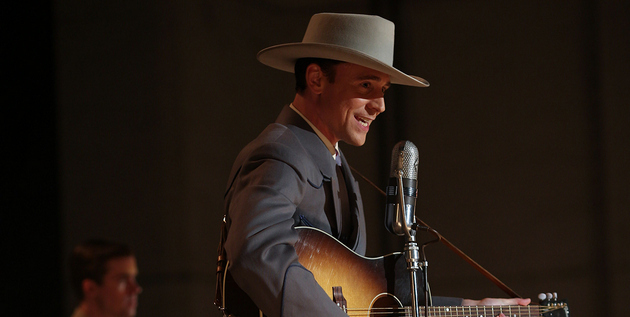 What made these morons cast Loki as Hank Williams in the first place? They should’ve just cast ME in the role. Either that, or they could’ve had Disney make this movie. That was the original plan, unfortunately Reed Richards nixed the idea. Curse the infernal interloper! I shall toss him into my darkest dungeon and bombard him with an unending torrent of the most horrific Metro-Bro music imaginable! Tom Hiddleston carries absolutely no weight with me whatsoever. I would sooner recognize him from voice work on Robot Chicken or Family Guy as I would some comic book film. I had no idea they made 1 Thor movie–let alone 2. So unless this movie was always gonna hit it out of the park, then maybe they should have cast someone a little more in line with their target audience. And as a 50 year old country boy, I would say I am right smack dab in the middle of that demographic. (Gasp) Who dares incur the wrath of Doom?! Amen …..wrong casting if only cuz there’s really no cred . Jeff Bridges can’t sing at gunpoint but I’ll buy his country cred . I don’t think today’s teenage girl Taylor , Luke , Hunter , Sam ” country ” fan knows , cares or wants to be enlightened about Hank . Hank who ??? Why would she ? Why didn’t they cast someone who had screen and cultural appeal to an audience who DOES know , care and wants to know something about Hank ? Duh ? I don’t know about his fans, but Hunter knows Hank! Well, that’s what I expected. I doubt another movie about Hank will be made for a good while though. Here’s a random question for anyone here who is in the music business. How much do you think people like Cody Jinks, Eric Allen(Whitey Morgan), Evan Felker(Turnpike Troubadours), Cody Cannon(Whiskey Myers), or music stars like them make? I think this one was in the cards completely. The only way films like this succeed is by being absolutely massive in design. “Ray” was a great example of this. The intensity ran so deep that it bled out of the screen. By comparison, “Ring of Fire” that awful June Carter motion picture was just a montage of scenes, and it didn’t carry a whole lot of emotional weight. The reason “Walk the Line” stunned was because Johnny kicked out footlights, he fell over, he ripped up a check. “Walk the Line” was intense, and unfortunately, intensity isn’t the goal of a lot of these pictures. Besides, he already have a masterpiece of a Hank Williams motion picture in “The Last Ride.” it’s a gorgeous picture that really encapsulates how Hank Williams saw himself and his work. From what I heard, before Johnny and June died, they actually had pretty heavy input on Walk The Line and even told James Mangold that whoever got picked to play Johnny Cash in the film, he had to actually learn how to play guitar. Just telling you what I heard from my perspective. Trigger do you know if the movie was released overseas and if so how much has it made? Thank you. You can’t discount the demographic issues that plague a movie like this. Most moviegoers today have never heard of Hank Williams and don’t care to learn. And many of those who do know the name are culturally predisposed to ignore anything that is focused on country music or the south. “I Walk The Line” had the same trouble, and figured out how to overcome it with a strong screenplay and a keen marketing push to where the younger generation was the one driving interest. That is why the failure of “I Saw The Light” is a double whammy. It could have been the vehicle for introducing Hank to a new generation. But when young, connected folks saw the reviews on their smartphones, they avoided the theaters in droves, even though Loki was playing Hank. Cash had/has more people actually aware of him though publicly. The Ric Rubin period really helped the appeal. I saw the movie but they left out so much. I think it would of been a lot better if they lip sync Hank’s real voice. This could of been a lot better. , and the Williams family wasnt even consulted???. So much was left out and they completely left out the death part of the story to avoid upsetting those who have different theories surrounding it…the ONE thing that could have brought some publicity to the film…I knew the story but just didn’t feel drawn in. I didn’t believe the actor pulled off the character…I really hope a better one comes along but not holding my breath. You must have really hated “Gone with the Wind”, then. Loved gone with the wind Clark Gable did an amazing job! According to Colin Escott, whose book the movie is based on, there were not seven encores. There wasn’t even one. Others disagree, but that’s why it wasn’t included in the movie. I didn’t know that but ive seen documentaries where artists like little jimmy dickens and Minnie pearl and others talking about the 7 encores and how he stole the show that night and red foley finally had to talk to the audience to calm them down…. maybe urban legand? Maybe not? The seven encore story is the one I’ve always heard. But having just re-read the Colin Escott biography, he goes out of his way to say it never happened. Who knows what story is true? Minnie and Jimmy Dickens were there. Colin wasn’t. But who knows? I’ve always been skeptical of the seven encores story (actually I believe the legend goes that he was called back for seven encores but only came out for six) due to the time constraints of the radio broadcast. Escott’s research seems to be solid so if he says there was no encore there must be some documentation confirming that. But enough people who were around claim it happened that the legend must be based on some kernel of truth. Maybe he came back to the stage to take additional bows but didn’t sing. Maybe he came back and played an extra set for the live audience after the broadcast. Maybe it happened at a different venue. Maybe everybody was drunk and doesn’t really remember, who knows. It’s a great story, but I commend Abrams for consistently sticking with his chosen source. Yea, your right who knows? one things for sure you and I wasn’t there! One things for sure the movie could have been great instead of ok…. wow, I hadn’t even heard that it was coming out… Curb records must have been in charge of the promotion. Well, sad that they couldn’t get it right. You’d think someone like Hank Williams would get the full work up.